The comp season is quickly approaching and it still looks like summer here! We finally had a hard frost, but actual winter feels a long way away. The first comp is in Bozeman, Montana in just over a month. 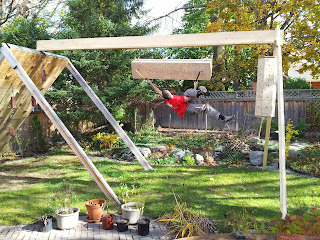 Training at home was getting a little boring so I added onto my backyard wall. Its starting to resemble a jungle gym. I put a 20 foot long beam off my 16' wall and then hung wooden boxes to simulate the ice blocks found on the competition routes. Its been a slow process of constructing it but one more box and it will be done. For now..